One of the many great things about our little town is its location. Mexico Beach is lucky to have some really great neighbors, and we encourage you to get out and meet them! Each one of these neighboring destinations makes a wonderful day trip. 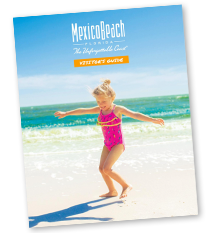 So get out, explore, and make your Mexico Beach, Florida visit even more unforgettable. The Dead Lakes State Recreation Area offers the finest freshwater fishing grounds in the state of Florida. The lakes are strewn with the stumps and trunks of dead cypress trees, creating a stunning vista. Wewahitchka is well known as an important source of Tupelo honey and served as the location for the 1996 Peter Fonda film, Ulee’s Gold, of Sundance Film Festival fame. The cape is a great picnic spot, offering visitors a backdrop of towering white sand dunes at either St. Joseph Peninsula State Park or Gulf County’s Salinas Park. Cape San Blas is also one of the very few beaches in the entire state of Florida where horseback riding is permitted. These incredible locations might be off the beaten path, but they make great day trips for visitors seeking the wild side of Florida. St. Vincent National Wildlife Refuge, which can only be reached by water, is home to countless species of birds, wild boar, the endangered red wolf, and many more animals. The preferred point of departure is Indian Pass—a historic trading post and the fabled site of Spanish buried treasure. Need a break from the peace and quiet of Mexico Beach? Panama City Beach, a popular spring break destination, needs little in the way of introduction. Spend the day enjoying family-friendly attractions such as Gulf World Marine Park, ZooWorld, and Shipwreck Island Waterpark. There is no shortage of great nightlife either—the city is home to hundreds of great restaurants, nightclubs, and gathering spots. This quaint fishing village just thirty-two miles east of Mexico Beach on Highway 98 will take you back in time to the mid-1800s. Be sure to spend some time viewing the beautifully restored antebellum homes in the Historic District, relaxing at scenic Lafayette Park, and browsing the numerous antique and specialty shops. Visit the waterfront to welcome commercial fishing boats as they bring in the day’s catch, and dine on Apalachicola’s nationally acclaimed oysters in any of the superb downtown restaurants. Although the site of a minor Civil War battle in 1864 and home to a number of restored antebellum homes, Marianna is best known for nearby Florida Caverns State Park. There, visitors will find the only air-filled, publicly accessible caves in the state. Ranger-led tours are available, and the park offers a host of additional amenities. If shopping is on your agenda, the Destin and Miramar Beach corridor will not disappoint. Silver Sands Premium Outlets is a shopper’s paradise with more than a hundred brands represented. Baytowne Wharf, Grand Boulevard, Destin Commons, and countless other nearby shopping opportunities will surely satisfy you as well. Claimed by some to be the site of Ponce de León’s Fountain of Youth, Wakulla Springs is the longest and deepest known submerged freshwater cave system in the world. The Edward Ball Wakulla Springs State Park, once roamed by mastodons, giant sloths, and saber-toothed tigers, is now home to manatees, alligators, and an abundance of birds. Several early Tarzan movies were filmed here, as was Creature from the Black Lagoon. The park service offers guided boat tours throughout the year.